When one is going through the Intel Server Configurator to configure an Intel 1U server system that requires an additional PCI-E or PCI-X card such as a NIC, one must order the PCI-E/X component board as indicated in the Configurator. The (optional) after the title description Intel® Chassis/Platform Accessories can lead one to pass over the products listed there when going through a server configuration. 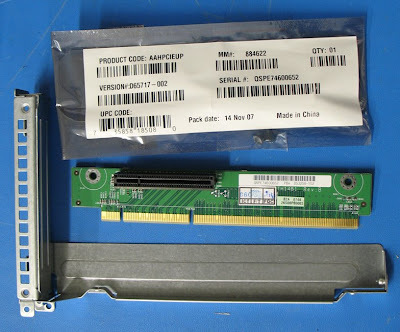 While the PCB PCI-E/X is listed in the optional section, it is a required component if one needs that full height slot for an add-in card as indicated in the brackets behind the listing for the riser PCB. The bracket at the bottom comes with the SR15xx series 1U server platforms. The shown riser is the PCI-E one that will be bolted to the riser bracket. It will then be installed into the server chassis after the add-in card is installed on the riser. This is just one of those details that can be overlooked when one is in a bit of a hurry to get the quote out to our client. In the end, the riser PCB is not that expensive, but it still counts as a hit against our margin on the end product server if we miss it during the quoting phase. If the PCI-E/X product is not available at our regular suppliers then we would waste a bunch of time trying to find one locally. If we cannot find the riser PCB, then we are in a position where we may need to delay things with our client. In the end we look unprofessional by having to call the client up and try and reschedule the server install. The call to delay the server install would not have had to have been made if we knew beforehand that the riser PCB was needed and not readily available. We would have scheduled things with a larger time buffer, and spent a bit of time looking about the Internet for someone who did have one in stock.